I've always loved 'em. 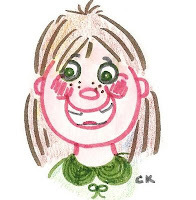 Wished I was the freckled type, preferably with red hair, like Pippi Longstocking, or Anne of Green Gables, or even my best gradeschool friend Julie Nichols. Freckles are friendly and soft and look so good under long eyelashes. They are sun-bits in colors of peach, tan, brown, fawn, charcoal. No wonder Gerard Manley Hopkins praised freckles. To my surprise, I found my second-grade school picture, and lo and behold, there above my mouth with its missing front teeth, there were freckles on my nose. I, too, have been freckled.